Images show a 6-foot sphere that will be installed next week in the Bishop Museum Planetarium lobby. It will display images of planets, weather and solar storms. On a sphere 6 feet in diameter, floating five feet off the ground, "viewers can watch 500 years of changing climate or travel back to the time when the Earth's continents were one large land mass. They can see the sun erupting in spectacular solar storms." That is how the National Oceanic & Atmospheric Administration's Office of Education describes Science on a Sphere that will hang in the Bishop Museum Planetarium's lobby. "It is so cool for us ... so fun. We can't wait until it opens," said Carolyn Kaichi, planetarium manager. The exhibit will open March 11 at the museum's Second Annual Mad About Science Festival with a program about Earth and other planets in the solar system. The Bishop Museum is the first of four science and technology centers receiving NOAA Environmental Literacy Grants for installation of the sphere system and development of programs. "We were one of dozens of organizations that applied to get it," said Mike Shanahan, the museum's education director. "It should be really a great addition to our programming." He said it will compliment the museum's new Science Adventure Center and other exhibits. The 200-pound, 68-inch fiberglass sphere will be suspended from an aluminum structure serving as a 3-D movie screen to display animated, color images from satellites and other geophysical and astronomical data. Four 3,000-lumen projectors and four personal computers will coordinate and synchronize animated images from global environmental data. As they shine on the sphere, it will appear to be a whole globe of Mars or some other planet, Shanahan said. Programs will at first be stationary, using planetary images taken from spacecraft, he said. "By July we will feed in more and more programs that deal with Earth, and they will be animated. You will see cloud motion or rotation of a planet." He said the museum will work with national and local NOAA offices to develop educational programs and exhibits for the sphere. Programs will be created that deal with planet Earth, using museum staff processing data sets from NOAA and other organizations, he said. For example, he said, "It could become a globe showing current hurricane conditions on Earth." The NOAA grants include money to develop programs for schoolchildren. Bill Thomas, director of NOAA's Pacific Services Center, said in a news release: "We're thrilled to make this a reality for the Bishop Museum. "From viewing our sun erupting in spectacular solar storms to following tsunamis, hurricanes and the migration of whales, the possibilities for using this exciting and invaluable state-of-the-art educational tool are endless." According to the NOAA Web site, "Science on a Sphere owes its start to a beach ball." It says Sandy MacDonald, director of NOAA's Earth System Research Laboratory Global Systems Division in Boulder, Colo., created the system after experimenting with a beach ball on the deck of his home. "His aim was to develop a 'spectacular tool' to explain NOAA science to a variety of audiences," the Web site said. "Sandy's brainchild is a highly creative, exciting way to present NOAA global science and operations to the public." NOAA began the program in June at Nauticus, the National Maritime Center in Norfolk, Va., presenting programs to nearly 9,000 students from June to September and more than 50,000 others. 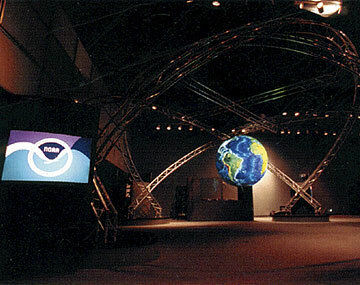 Other science centers receiving Science on a Sphere grants are the Tech Museum of Innovation in San Jose, Calif., the Maryland Science Center in Baltimore and the Science Museum of Minnesota in St. Paul.